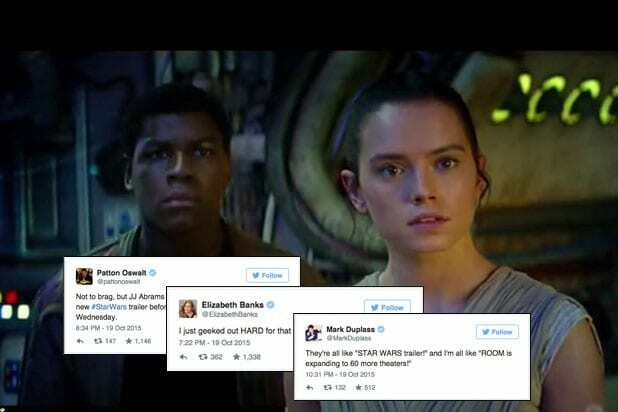 Hollywood is hot and heavy for the “Star Wars: The Force Awakens” trailer that premiered during halftime of ESPN’s “Monday Night Football,” and actors, comedians and TV personalities took to social media to express both their excitement and their disappointment. Between 7:50 p.m. ET and 10:50 p.m. ET, 390,000 tweets were posted about the new trailer, and when it aired, more than 17,000 tweets were sent per minute. This included Hollywood stars such as Elizabeth Banks, Nick Swardson and Jack Falahee, who seemed to love the trailer. However, Piers Morgan joined the official #MayTheForceNeverBeWithMe hashtag, tweeting, “Never watched any Star Wars movie & not going to start now.” Mark Duplass was more excited for Brie Larson‘s “Room” expanding to 60 theaters, than the new trailer. While Morgan and Duplass were less than stoked on the new trailer, it seems that the rest of the United States decidedly was — after all, multiple ticket brokers like Fandango and MovieTickets.com crashed from buyer overload. See some of Hollywood’s reactions below. I just geeked out HARD for that Star Wars teaser. I had gone almost a full calendar year resisting the temptation of watching any @starwars #ForceAwakens trailers until tonight. I broke. They're all like "STAR WARS trailer!" and I'm all like "ROOM is expanding to 60 more theaters!" "It's true. All of it. The Dark Side. The Jedi. They're real." https://t.co/zvI85sVTPz I let the Force in me and I'm clenching so it stays! Am I rock hard after that Star Wars trailer??????? Yep. "STAR WARS VII IS ANTI-WHITE!!!" "But…it's robots and aliens and spacesh–" "WHITE GENOCIDE!!!!!!" "Um…" "BLAAARGAGLEARBL!!!" Not to brag, but JJ Abrams is sending me a Vimeo link of the new #StarWars trailer before you losers get to see it Wednesday. I'm only stating the obvious, but @starwars: The Force Awakens looks like it's going to be the greatest thing since the empire struck back.